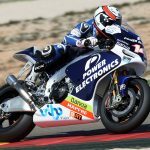 Team Aspar revealed its new livery for its Honda RCV1000R racebikes. 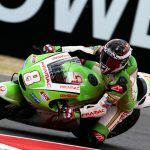 The team revealed the silver and green livery in Malaysia, where riders Nicky Hayden and Hiroshi Aoyama will join the rest of the MotoGP grid in preseason test at the Sepang circuit. The colors represent the Malaysian energy drink manufacturer Drive M7 which signed a three-year deal to be the team’s title sponsor. The predominantly silver color scheme blends in with the RCV1000R’s frame and swingarm while a bright neon green highlights the fairing nose and fuel tank, along with Hayden’s signature #69 and Aoyama’s #7. Representing its riders’ nationalities, the Drive M7 Aspar RCV1000Rs sport an American flag motif below the seat on Hayden’s machine, and the Japanese flag on Aoyama’s. The 2014 season brings a lot of changes to Aspar and its riders. Hayden joins the team after five seasons with the Ducati factory team while Aoyama raced last season for the Avintia Blusens team. As for Aspar, the team is switching from the Aprilia claiming-rule machine to Honda’s RCV1000R in the new-for-2014 Open class.